ACS Calibration offers laboratory and on-site Humidity Instrument Calibration Services. Our ISO / IEC 17025 accredited, National Institutes of Technology (NIST) traceable Humidity Instrument Calibration services will ensure that your instruments can be trusted for accuracy and repeatability. 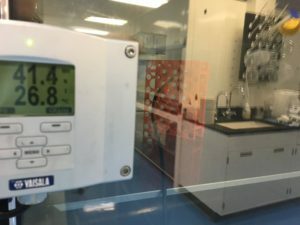 ACS Calibration is committed to providing our customers with high quality Humidity Instrument Calibration services in compliance with the governing standards of this industry and to help customers meet their regulatory needs. ACS Calibration has the experience and capabilities to meet your Humidity Instrument Calibration requirements. We use OEM, military standard procedures, internally developed procedures, or we can custom design a custom Humidity Instrument Calibration procedure based on your application and requirements. ACS Calibration offers free audit support for customers regarding calibrations. ACS Calibration provides Humidity Instrument Calibration services for an wide variety of industries, manufacturers, and models. Humidity Instrument Calibration, maintenance, repair, and sales. When performing Humidity Instrument Calibration our technicians test the full range of instruments in accordance with your directives, specifications, Federal, or other regulatory requirements. ACS Calibration offers ISO 17025 accredited calibration services in multiple disciplines. All Humidity Instrument Calibration are compliant with ISO 9001 and NIST traceable. Humidity Instrument Calibration services are available either at our laboratory or at your facility, depending on location and number of instruments requiring calibration. If you need to maintain the accuracy of your instruments, then you need Humidity Instrument Calibration services from ACS Calibration. Our Humidity Instrument Calibration processes ensure that your instruments meets engineering, machining, parts design, quality control, and inspection requirements. You’ll be confident knowing that your instruments will provide accurate measurements. We are an ISO 17025 accredited calibration laboratory headquartered in Alabama with a focus on the Southeastern region including Alabama, Georgia, Florida, Mississippi, Louisiana, Arkansas, Texas, Tennessee, South Carolina, and North Carolina. We have a network of laboratories in North America and Central America to ensure that your calibration requirements are met, regardless of location. Founded in 1989 by electrical engineers, ACS Calibration prides itself on both customer satisfaction and the high quality of work. Our experience working with leaders of the United States Navy Metrology Lab and education as American Society for Quality Certified Calibration Technicians has provided a solid basis and a high level of working knowledge in electrical, dimensional, mechanical, thermodynamic, and weights and balance metrology. At ACS Calibration, we work with our customers to develop a relationship and partnership. We take our time to do the job right, the first time, every time to ensure that your needs are met and expectations exceeded. For the fastest calibration service, choose on-site Humidity Instrument Calibration=. When calibration testing is performed onsite, instruments are returned to rotation immediately. ACS Calibration has a wide range of capabilities to perform on-site calibrations of your instrumentation. On-site Humidity Instrument Calibration services both reduce the amount of down time and eliminates the need for costly backups of instruments. Rather than shipping your equipment out and waiting weeks or longer for the item to return – schedule an on-site calibration event with us and let our technicians come to you. Additionally, many instruments, such as environmental chambers, test stands, hardness testers, and optical comparators, are too large to be economically shipped. ACS can document the instrument department, location, user, and additional pertinent information to ensure your assets are identified and managed in accordance with your regulatory requirements. Click here to learn more! ACS Calibration strives to maintain a quick Humidity Instrument Calibration turnaround time for all of our clients. A key factor in client satisfaction, in addition to the quality of calibrations performed, is the turnaround time. Our technicians strive to get the job done as efficiently as possible while maintaining the high quality of service that has become expected of ACS Calibration. Do you have a specific turnaround time request for your Humidity Instrument Calibration? We can work with you to ensure that all of your requests are met. Click here to learn more! ACS Calibration is accredited to ISO 17025 in multiple calibration disciplines. ISO/IEC 17025 General requirements for the competence of testing and calibration laboratories is the main ISO standard used by testing and calibration laboratories. If we are not accredited in a discipline, we would be happy to work with you to find a laboratory that meets your requirements. Click here to learn more! ACS Calibration utilizes Fluke MET/TEAM calibration software to manage your calibration and asset management program. Fluke MET/TEAM, which stands for Metrology, Test Equipment and Asset Management, software was specifically developed to manage all aspects of your calibration program including calibration certificates and historical data, department, user, location, and additional tracking features. Regardless of the size or type of your business, we can help you maintain a compliant calibration program. Our calibration and asset management program has been developed to provide our customers with a comprehensive system that eases the burden on your employees. Our solution is complete and comprehensive – we maintain not only instrumentation calibration by ACS Calibration, but we also maintain the data for third party and internally calibrated instruments. We schedule calibration due date reports to be emailed out based on each customer’s individual needs. Calibration certificates are available on-line in our calibration database to support your audit activities. Our ISO 17025 accredited laboratory and quality management system ensures that your instrumentation is both calibrated and managed at the highest level of quality. Click here to learn more!